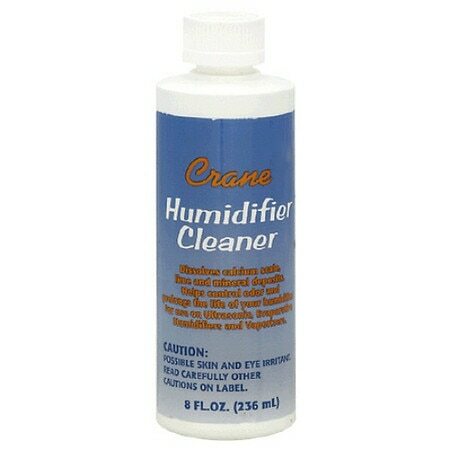 Crane USA Humidifier Cleaner1.0 ea. For complete cleaning and maintenance procedures, please refer to your instruction manual. For best results, empty the water from tank and base before cleaning. Apply enough cleaner to cover the soiled areas and allow it to soak for a few minutes. Wipe away all deposits and rinse thoroughly with clean water. To clean the tank, add a few capfuls of cleaner to the tank and mix with water allowing the solution to stand for several minutes. For heavily soiled surfaces apply the cleaner and let it soak for a longer period of time. Possible skin and eye irritant. If swallowed, contact a Poison Control Center or doctor immediately. If in eyes, rinse with plenty of water for 15 minutes, keeping eyelids open. Remove soiled clothes and wash before wearing.